To spark discussion, the Walker invites local artists and critics to write overnight reviews of our performances. The ongoing Re:View series shares a diverse array of independent voices and opinions; it doesn’t reflect the views or opinions of the Walker or its curators. Today, local artists Hiponymous share their perspective on the opening night of Wunderbaum & LAPD’s Hospital. Agree or disagree? Feel free to share your thoughts in comments! We were all talking about our opinions regarding Obamacare five years ago, and for better or for worse, we are just now beginning to see how Obama’s Affordable Care Act is playing out as a solution to the US healthcare crisis. Hospital kicked off the Walker’s Out There series last night, taking the stage with dance, video, music, and personal narrative, a sensationalized performance about how healthcare is an unpredictable component in the lives of many Americans. Los Angeles Poverty Department (LAPD) collaborates with Wunderbaum, a Netherlands-based theater collective, and their initial presentation is a disorientating and intensely configured stage set-up. Rows of office desks span the length of the space, a gurney sits in the foreground, and the outside frame is a shuffle of mic stands and video camera tripods. For some time we sit and are reminded of walking through the narrowing hallways of the medical field. The performers independently move about the stage, some with drive and others with a lack of clarity. Two actors hold an intelligible conversation behind a fixed camera, mic and projector, and a woman wades toward the gurney as others pace back and forth assembling tools, putting on hospital coats and pushing papers from one desk to the other. The scope of the stage is broad and the mild-mannered performers steady our points of interest. There is a quiet normalcy about their pace, their tone, raising doubts within our viewership as to when the show has started. Papers are dropped: was it a stage direction? What follows instills that yes, we are witnessing every detail of a performed narrative. The show, in fact has already begun. No, you don’t have time to run to the bathroom. A sudden chaos erupts in a dramatic, ER-like scene and the audience is brought to the birthplace of an average white American. We meet John Malpede, LAPD’s artistic director, who has been an active recipient of both the US and Netherlands healthcare systems during his lifetime. The chosen protagonist’s identity (straight, white, male) is frustratingly representative of the dominant narrative, which the creators are seemingly aware of; as the play develops, the intensive focus on Malpede becomes more clearly framed as an ironic choice. The story’s perspective, however, inevitably becomes a larger address on the health care issues facing both countries. We predicate Hospital’s intent with buzz words around single payer healthcare, tax payer split agendas, and American individualism; it’s here that the work starts asking probing questions. 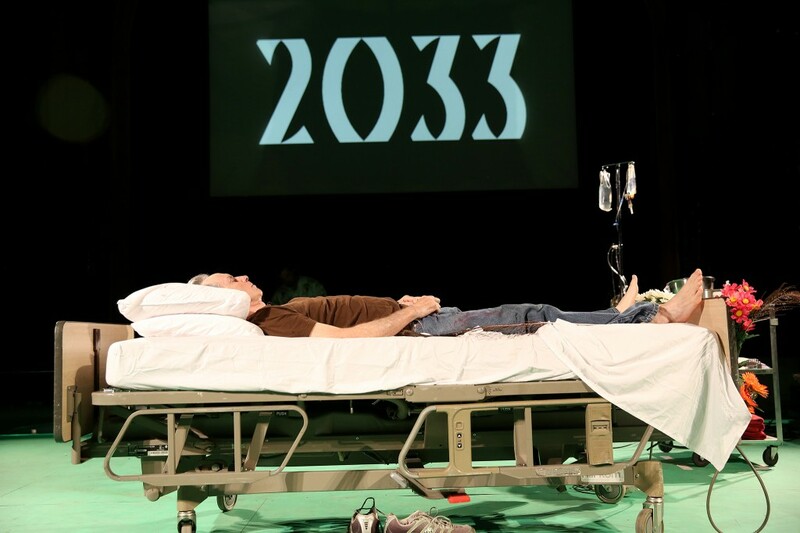 Through both fictional and factual presentations, Hospital asks, what kind of political mobilization will it take to achieve a sustainable, national healthcare system? What would that free system look like? The performers never pause to answer these questions, but rather move through embodying an array of characters: medical professionals, lovers, politicians. They nudge the audience through John Malpede’s true life encounters with the healthcare system, taking time to elaborate at junctures where Malpede disputes the voices of debt collectors and insurance representatives. The narrative reveals itself both on- and off-mic, and with the spirit of street theater the performers are generous with their direct, linear storytelling. It’s the rapid changing of characters, camera frames, and pace of performance that become metaphor for how people get lost in the shuffle of the system. With what they’ve coined as a “ficto-mentary” mode of delivery, LAPD and Wunderbaum desire to show us, in many ways, that the main character’s story is interchangeable with others who participate in broken healthcare systems, not once admitting outright Malpede’s evident privileges. The buzz words start up again at “hipster-ism,” Jim Crow, and Skid Row, which the performers use to ask the audience to consider the privilege of claiming individuality and importance within the system. While Hospital asks more questions than it could possibly answer in one hundred minutes, let alone one’s lifetime, the rigor and dynamism of the performers grounds us. They offer us a creative and imaginative contemporary framework, so that relating our personal experience to these systemic issues becomes tangible and devising solutions seems feasible. Wunderbaum and LAPD perform Hospital January 9-11 at 8 pm in the McGuire Theater.